If you’re looking for Scooby Doo costume ideas then it’s not just about Scooby, but the whole Mystery Inc crew. Scooby Doo was always one of my favorite costumes growing up and I loved how Scooby would jump into Shaggy’s arms when he was scared. Just thinking about it I want to put on a Scooby voice and talk about the cartoon! I think maybe it’s time to throw a Scooby Doo party and get everyone to dress up as their favorite Scooby Doo character. Imagine lots of food, a mystery to solve and everyone wearing Scooby Doo costumes – how much fun could you have? His manner of speech is really endearing and quite distinctive. I love speaking in a Scooby voice although I get a strange look from my daughter on occasion (I’m so embarrassing apparently!). 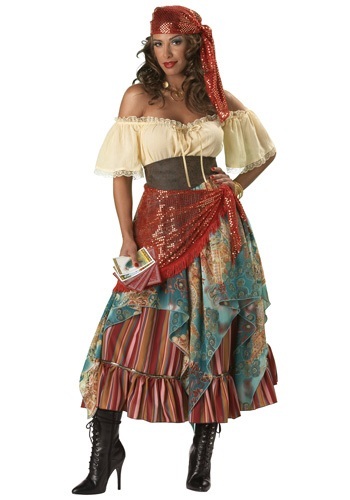 If I’m wearing this particular costume though I really don’t think she can complain about me sounding like Scooby …… or can she? The costume itself looks like a lovely, warm adult onesie which seems ideal for Halloween or a Christmas fancy dress party. I say that it looks warm, but it doesn’t actually say what it’s made of so I don’t know if it really is warm or not, but with a one piece you can always wear something underneath if need be. 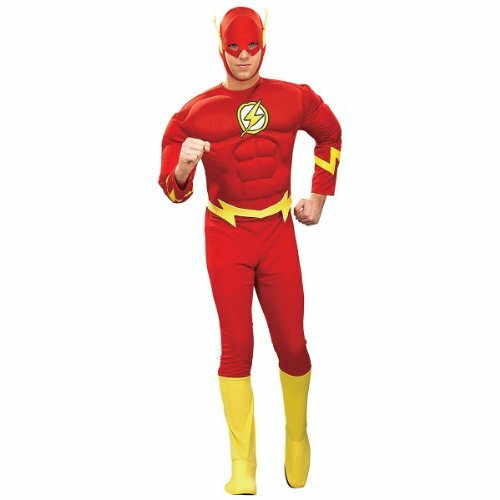 The costume has a front zip which is great because it means you can get in and out of the costume by yourself – there’s nothing worse than a costume that does up at the back and you need help when visiting the bathroom! The cool Scooby headpiece is also attached to your ‘onesie’ and you also get hand covers, but nothing for your feet. 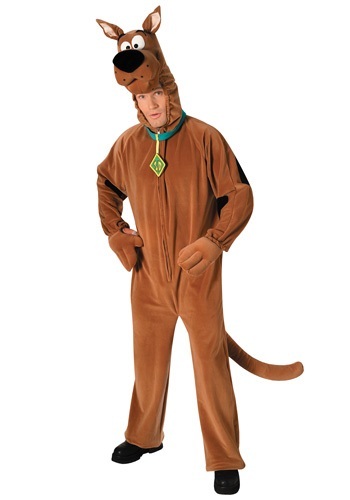 The younger members of your family can also dress up as Scooby if they want to as well, I particularly love the cute, baby bunting Scooby costume. Personally I never thought much of Freddie I always thought he was too straight, I guess in retrospect he was always the most skeptical of the gang, rather like the Scully to Shaggy’s Mulder! Daphne used to annoy me because I used to think of her as an airhead, she was always the one who got into trouble and I used to think she should just leave the group and go and become an air hostess! Shaggy and Scooby were best friends and I think were everyone’s favorite characters. Like Scooby Shaggy was always afraid of danger and was also always hungry. Mind you if a ‘monster’ had tried to take a Scooby Snack then he would have launched forward with a cry of ‘Zoinks’ and save the day. When push came to shove Shaggy would always do what was needed to help his friends even though he was scared to death and I think that’s why everyone loved him – it’s a definition of a hero. I always identified with Velma because I wore thick glasses as a child and I was also the shortest one in the family. I loved how she always managed to come up with the answer as to what the ‘monster’ really was and why that person had pretended to be whatever they pretended to be. I think having her as a heroine just had to be good for my self-esteem while being teased at school for wearing spectacles. The story of Scooby Doo has been described as being very similar to Enid Blyton’s Famous Five a series of books that I devoured when young so it’s hardly surprising that I enjoyed it so much. Fred or Freddy is very much the leader of the group. Velma is the smart one, good at analyzing things. Daphne is the danger-prone one, if any of them are going to be kidnapped it’ll be Daphne! So which Scooby Doo character would you like to dress up as? I think I would definitely choose Scooby Doo, not just because I’d enjoy talking like him all night either, but because I think he’s the cutest and the coolest! HOLD THE PRESSES! I’ve just found the most adorable dog costume that would be perfect for this theme, it’s the mystery machine van and it’s gorgeous, want to see for yourself? I just think it’s adorable, now I’ve just got to see if it will fit my dog and we’ll be set!